Why does Titan, Saturn's largest moon, have what looks like an enormous white arrow about the size of Texas on its surface? A research group led by Jonathan L. Mitchell, UCLA assistant professor of earth and space sciences and of atmospheric and oceanic sciences, has answered this question by using a global circulation model of Titan to demonstrate how planetary-scale atmospheric waves affect the moon's weather patterns, leading to a "stenciling" effect that results in sharp and sometimes surprising cloud shapes. "These atmospheric waves are somewhat like the natural, resonant vibration of a wine glass," Mitchell said. "Individual clouds might 'ring the bell,' so to speak, and once the ringing starts, the clouds have to respond to that vibration." The fascinating clouds, including arrow-shaped ones, that result from the atmospheric waves can cause intense precipitation — sometimes more than 20 times Titan's average seasonal rainfall — and could be essential in shaping Titan's surface by erosion. The research was published Aug. 14 in the online edition of the journal Nature Geoscience and will be published in an upcoming print edition. 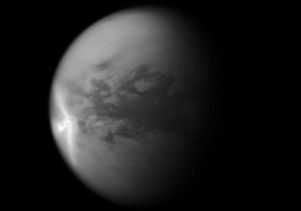 Mitchell and a colleague have described Titan's climate as "all-tropics" — the entire planet experiences the types of weather phenomena that on Earth are confined to the equatorial region. "Our new results demonstrate the power of this analogy, not only for general features of Titan's climate but also for individual storms," Mitchell said. "In future work, we plan to extend our analysis to other Titan observations and make predictions of what clouds might be observed during the upcoming season. "Titan's all-tropics climate gives us the opportunity to study tropical weather in a simpler setting than on Earth," he added. "Our hope is that this may help us understand Earth's weather in a changing climate." NASA's Cassini Spacecraft has been in orbit around Saturn since late 2004 and has revolutionized our understanding of Titan, which is larger in volume than the planet Mercury and the second largest moon in the solar system after Jupiter's Ganymede. Titan has a thick nitrogen atmosphere and experiences rain made of natural methane gas. "Titan is like Earth's strange sibling — the only other rocky body in the solar system that currently experiences rain," Mitchell said. Titan is an alien world, but strangely not so different from Earth. Like Earth, the main component of its atmosphere is molecular nitrogen. Water, too, is abundant on Titan, although it is all frozen in the crust at very low temperatures. Methane is thermodynamically active in the lower atmosphere, and much like water vapor on Earth, Titan's methane forms clouds, precipitates and is resupplied from surface sources, Mitchell said. The runoff then weathers the cold surface of Titan, creating what appears to be river patterns. Scientists think that Earth, shortly after it formed an atmosphere, had large amounts of methane and very little oxygen. Methane provided an important greenhouse warming that probably prevented Earth from staying perpetually in a completely frozen state that otherwise would have resulted from the weaker sunlight from the very young sun, Mitchell said. "Therefore, by studying Titan's modern climate, we may gain new insights about the way the early Earth's climate was," Mitchell said. He and his research group have developed an atmospheric model to study the climate and cloud patterns of Titan. Co-authors on the Nature Geoscience research are Máté Ádámkovics, a project scientist with UC Berkeley's astronomy department; Rodrigo Caballero, a professor of meteorology at Sweden's Stockholm University; and Elizabeth P. Turtle, a research scientist with Johns Hopkins University's Applied Physics Laboratory. Previous Story Poll finds two-thirds of California voters unprepared for costs of growing older Next Story Newts and salamanders can regrow their damaged hearts, so why can't we?